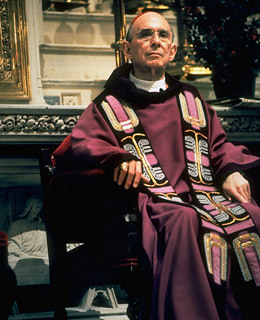 The 1990s included revelations concerning sexual abuse by Roman Catholic priests. Justifiably, people were outraged that trusted clerics had abused and taken advantage of children and youth. Cardinal Bernardin--though advanced in age--was one of the leaders of the group of priests who developed a system to deal with priests under accusation. In his archdiocese, he labored to develop a way of handling the tragedy and atrocity of what was fomenting and growing within the greater culture--a well earned distrust of clergy. His strong yet loving response to the brokenness of those close to him became a model for many priests and leaders throughout the United State of America. Yet, in 1993 Joseph Bernardin was accused of molesting a seminarian in Cincinnati. A metaphorical bomb went off in Joseph's life as he was raked over the coals by the media. He strongly denied all the charges but also refused to assault the character of his accuser. The story spun by the media and the culture was one of a powerful and influential leader fallen from grace into the pit that he had hoped to regulate.Joseph was abandoned by many who had been close to him. Yet, he still refused to retaliate against his accuser. Three months after the accusation, his accuser admitted that things were not as had been suggested. It seems that he had "recovered" the memories while working with an unlicensed hypnotist and had since deemed these memories to be fabrications and completely unreliable. Joseph went to his accuser--Stephen--as he lie dying from AIDS in a hospital bed. He was quick to forgive the accusations and became immediately concerned with the progress of the disease through Stephen's body. Ironically, it was Joseph who had spent years campaigning for Church support for those who suffered and died at the hands of Stephen's murderer. Joseph knew Stephen's plight all too well and Stephen died with Joseph's forgiveness and blessing. Joseph spoke of a "seamless garment" of life that the Church must be quick to endorse. He raised the question of what it could mean to the world if the Church would advocate a "consistent ethic of human life." This meant repudiating abortion, euthanasia, capital punishment, violence, and negligence to poverty and other murderous forces.Joseph challenged other Christians--as he had been challenged as a younger man--to step out and be a Christian first and foremost and a member of the Church only by consequence. Joseph's success in his clerical career had led him to power in the Church but a stunted spiritual life that he worked through for the rest of his life. One of the ways he expressed this commitment was his pursuit of the "seamless garment" of life for the Church he was a member of by consequence or his commitment to the Lord of Life. By Joseph's estimation, it made no sense to oppose abortion yet support violence or capital punishment. If life was valuable and sacred, then its value could not be forfeited by some set of actions. We cannot endeavor to protect some lives but not others while pretending to follow after an executed Lord who teaches love for enemies and mercy for all. Before Joseph died he shared his sincere hope born out of the reflection that accompanies a slow death: "My final hope is that my efforts have been faithful to the truth of the gospel of life and that you...will find in this Gospel the vision and strength needed to promote and nurture the great gift of life God has shared with us."